Eggplants contain substances, which minimalizes the cholesterol level in blood and pectin which elevates malicious substances output from organism. This salad will be appreciated by spicy food lovers. 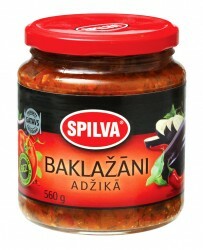 Garlic with chili pepper in combination with eggplants gives extraordinary spiciness. Eggplants in adjika is tasteful snack, as well as garnish on meat dishes and great as side dish. Product 100 g contains: energy value – 99 kcal (415 kJ), protein – 1.4 g, carbohydrates – 14.7 g, fat – 3.8 g, salt – 1.6 g.